Cambodia's Prime Minister Hun Sen gestures towards the Win-Win Memorial during its opening ceremony in Prek Ta Sek village on the outskirt of Phnom Penh, Cambodia, Saturday, Dec. 29, 2018. 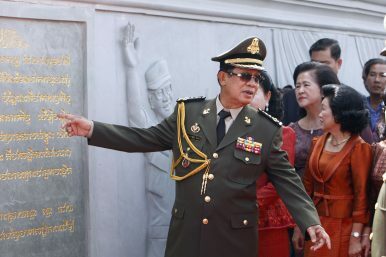 Having arrested his main political rival and transformed Cambodia into a de facto one-party state, Prime Minister Hun Sen continued his authoritarian streak by inaugurating a massive stone monument commemorating his own achievements. “Cambodia has united from the many factions to two and to one like today,” Hun Sen said, speaking to a crowd of thousands that included soldiers from all branches of the military. The foundation of the self-congratulatory memorial is a massive pentagon lined with carvings of Hun Sen’s most important political triumphs. Towering in the center is a 33-meter high stone monolith attached to a bunker-like base filled with historical documents. The entire complex is made from the same stone used to construct Cambodia’s most important religious site – Angkor Wat. But rather than honoring gods, this building honors the man who has ruled Cambodia for 33 years. The memorial was inaugurated on December 29, the 20 year anniversary of Hun Sen’s most important political stroke – the reintegration of Khmer Rouge soldiers into society and the permanent end of decades of civil war. Ly Sok-Kheang, director of the Anlong Veng Peace Center, said Hun Sen’s win-win policy was necessary to end an interminable conflict. “In the Cambodian conflict it was really hard to have one party win an outright victory because we did not have face-to-face warfare; it was more about guerrilla warfare. So the win-win strategy was a good approach for both parties to find common ground to end war,” he said in an interview. Hun Sen ended the war by guaranteeing that the Khmer Rouge holdouts would be able to keep their military positions and private property. When asked if a giant monument to himself was an appropriate way for Hun Sen to commemorate the end of the Khmer Rouge, Sok-Kheang declined to comment. He did say that while 20 years of peace was a good start, more still needs to be done for democracy and human rights in Cambodia. Ear Sophal, a Cambodian-American professor of diplomacy and world affairs at Occidental College, agreed that ending the civil war was a success, but added that the Khmer Rouge were already on the brink of collapse. “It’s a genuine diplomatic achievement, but not nearly as impressive as he would have us believe,” he said in an email. Sophal said Hun Sen is cherry-picking nuggets of history to make himself look better, and his legacy is far from one of a national unifier. Since taking power over 30 years ago, Hun Sen has ruled Cambodia with an iron grip. His crowning political achievements have for the most part been undemocratic and self-serving. In 1993, he refused to accept the results of the UN-administered election, forcing election winner Prince Ranariddh to accept a co-prime minister arrangement. Four years later, Hun Sen sent Ranariddh fleeing as he consolidated power through a bloody coup. In 1998, rising political star Sam Rainsy was targeted by a grenade attack that killed 16 and has been linked to Hun Sen’s chief bodyguard. Hun Sen’s regime has continued to dog Rainsy for decades, forcing him to flee the country to avoid politically motivated prison sentences. In a recent email, Rainsy said the “crazy monument” distorts history and wastes money. “In my eyes, Hun Sen’s main achievements are institutionalized nepotism, systemic corruption, massive and destructive deforestation, plundering of state assets by his relatives and cronies, persistent poverty for the vast majority of the Cambodian people, revolting social injustice, serious human rights violations and destruction of the democratic legacy from the international community,” he said in an email. More recently, the Cambodia National Rescue Party (CNRP) posed a legitimate electoral threat to Hun Sen’s hold on power. Rather than facing them at the ballot box in the 2018 national election, Hun Sen had the party dissolved and its president arrested for allegedly plotting to topple the government. While the dissolution of the CNRP and the arrest of Kem Sokha have been blasted internationally as transforming Cambodia into a one-party dictatorship, the move is enshrined in the carvings of the Win-Win Monument. Hun Sen claimed to be resurrecting his Khmer Rouge era win-win policy by urging CNRP members to defect before the dissolution. The situations are hard to compare, however. Hun Sen inherited a conflict with the Khmer Rouge that he then solved, but he created the conflict with the CNRP in the first place. Under the guise of “preventing color revolution,” Hun Sen now glorifies the destruction of democracy as a “win” for Cambodia. Sophal said Hun Sen simply uses the excuse of “national reconciliation” to violate human and political rights for his own benefit. During the inauguration, Hun Sen also lashed out at his favorite rhetorical enemy: the United States. The premier has frequently accused the Western superpower of foreign interference and violating Cambodia’s sovereignty. He reminded listeners that the United States overthrew Lon Nol, leading to the power vacuum that allowed the Khmer Rouge to gain control. Hun Sen has remained conspicuously silent when it comes to China’s financial support of the Khmer Rouge, however. Sophal said that Cambodia has only become less independent as it has come to rely almost exclusively on China. What’s more, Sophal believes that Hun Sen’s recent actions have endangered Cambodia’s only true success – economic growth – by inviting sanctions from the Western world.